Poor R, driving like a maniac today. First, we went down to the Farmer's Market to see what the Ithaca Art Market was like...how much were people charging, what was the expected presentation, who was there, the types of offering and the subject matter that the art addressed. Interesting. Everything of any substance was matted...so the inexpensive mats are in order as well as the plastic sleeves. Pricing for prints and giclees were the "going rate" ($45 for 8.5"x 11") to something more in the mid $20 range. And it goes from there. I think the lady from Spirit and Kitsch has her pricing pretty much sharpened for sale along with nice print promotion and postcards to promote her web presence etc. The Ithaca Art Trail brochure was out with my rooster featured inside and on the cover. I just checked their website to find my loon and rooster as the header for the artists' page. Big coverage. Then back to the lake for swimming and bobbing in the cool water with Shady Grove at a distance up on the now pristine dock (thanks to the bobble head Owl we have as well as a 'Scare eye" ball positioned under the dock to frighten the nasty gulls from covering our dock with a thick layer of poop. The scare eye is supposed to look like the eyes and open beak of a predator bird to the gulls and swallows. I guess it does. They have been frightened away. 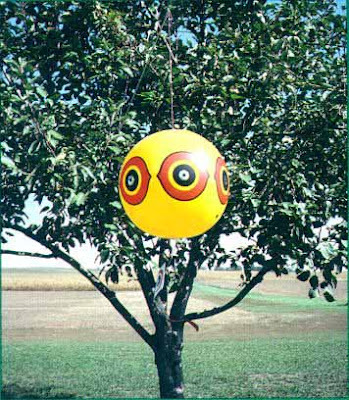 I however, adore the Scare eye balls and now have plans to decorate the house with them. About $85. for a dozen of them. And think of the effect. You could use the eye in a fabric etc. And, think of a teeshirt. My mind is on fire!>?? The water was perfect and just brisk enough to keep you moving. It had the spa effect and the boys immediately had to go lie down for an hour to recover from where the swimming takes your mind. Away. Erased. We love it just for that. We left around 5:30 to drop me off at school with a perfect dinner from Doug's Fish Fry in Skaneatelas. We sat in their secret garden off the parking lot surrounded by flowers, birds and these strangely pruned trees. Very "Little Prince" and the Baobab trees. Shady sat with us and watched (without tugging or dragging us around the yard) the squirrels, birds and other dogs with their families. Man, how did we get such a good one? I am a bit tearful to see the home team leave me. But jobs, golf games and horses await along with more spa swims and the pace that summer sets in August.They will be fine, I just will miss them tons. The spa effect is working on my brain, so I think I will play hookie with my portraits book for one more night and delve into the world of Hogworts and Mr. Potter.